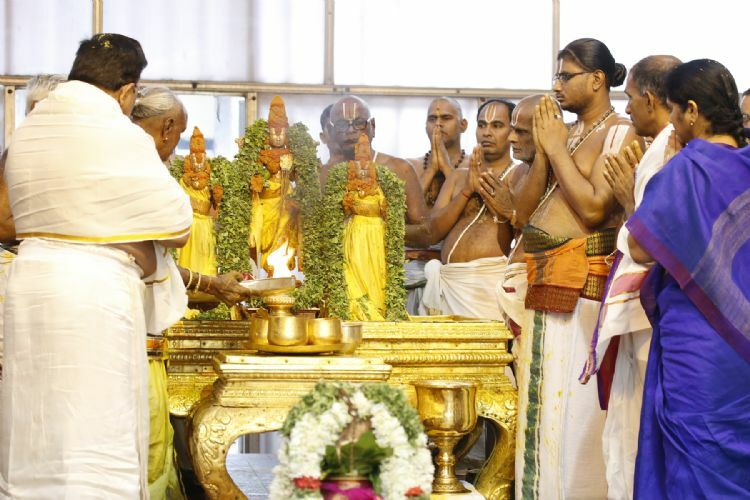 Tirumala, June 1: The three-day annual fete of Jyesthabhishekam began in a ceremonious way in Srivari temple in Tirumala on Monday. The processional deities of Lord Malayappa and His consorts Sri Devi and Bhu Devi were taken to the special platform in Sampangi Prakaram after the second archana and second bell at around 7am. 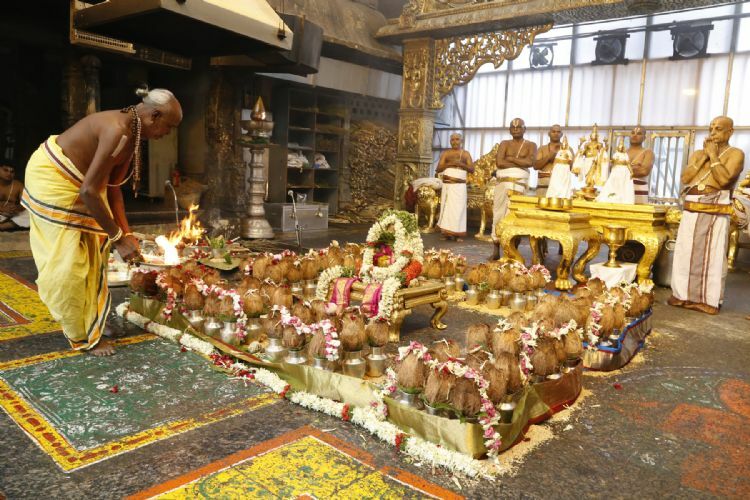 Later Mahashanti homam was performed by the temple priests amidst the chanting of Vedic mantras by 8am. This ritual was followed by Satakalasa Tirumanjanam(celestial bath with holy waters filled in 100 silver pots) between 9am to 11am. Usually this festival is performed once in a year for three days in the month of Jyestha with festival concluding on Jyestha Nakshatra. As per legend this festival is celebrated to give longevity to the icons of Utsavarulu. TTD has cancelled Visesha Puja and Vasanthotsavam following the annual Jyesthabhishekam in Srivari temple on first day. Later in the evening the processional deity of Lord Malayappa Swamy was adorned with Vajra Kavacham-the gold armour studded with precious stones and diamonds which will be worn only on this occasion once in a year. Later Sahasra Deepalankara seva performed to Lord. The devotees were thrilled to see the Lord in this unique armour during the procession along four mada streets on Wednesday evening. TTD Board Chairman Dr Ch Krishnamoothy, TTD EO Dr Sambasiva Rao, Tirumala JEO Sri KS Sreenivasa Raju, Trust Board Member Dr P Hariprasad, Temple DyEO Sri Chinnamgari Ramana, Peishkar Sri R Selvam,Temple officials took part in this fete. The festival of "Jyesthabhishekam" is performed in the holy month of Jyestha as per Hindu Almanac and the fete is completed coinciding the star of Jyestha in the constellation. This festival is also called 'Abhidhyeyaka Abhishekam'. 'Abhidhyeyakam' means protective shield or armour (that which cannot be destructed). To fight against the evil, the Lord emerged with this protective armour in this Kaliyuga. 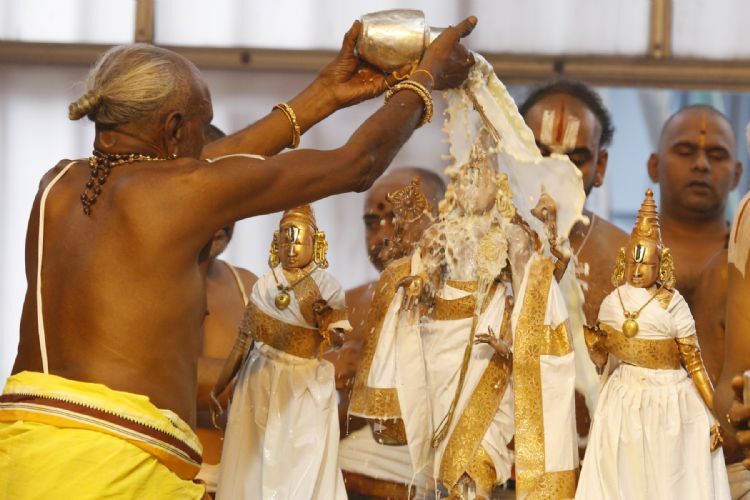 Since the special abhishekam (celestial bath) is conducted to this special 'Armour of God' this festival is also called Abhidhyeyaka Abhishekam. As this festival takes place in the month of Jyestha,(usually falls in June or July)it is also known as 'Jyesthabhishekam'. This celestial fete is only two decades old. As per the temple legendary, this special Abhishekam is usually performed every year to protect the Utsava deities of Lord Malayappa swami and his consorts Sridevi and Bhudevi from damage that might occur while conducting processions and Tirumanjanam (holy baths) all through the year during different festive occasions. This festival lasts for three days. Each day after the second bell, the lord and his consorts are taken to the Kalyanotsava mandapam located in Sampangi Prakaram and Snapana Tirumanjanam is conducted amidst the chanting of vedic mantras. Snapana Tirumanjanam involves performing a bath to the deities involving holy and consecrated water mixed with spices including turmeric, sandal paste, honey, milk and curd. Later the lord and his consorts are adorned in different attires (special kavachams)on each of these days. On First Day Lord muses pilgrims in Vajrakavacham (armour studded with diamonds), followed by Muthyala kavcham (armour studded with pearls) on second day. The Vajra and Muthya kavacham are adorned to Lord only during this time in a year. On final day, the Lord will be draped in Svarna kavacham (armour made of gold) and this Svarna kavacham remains adorned to the Lord throughout the year and only removed for Abhidhyeyaka Abhishekam in the year next.